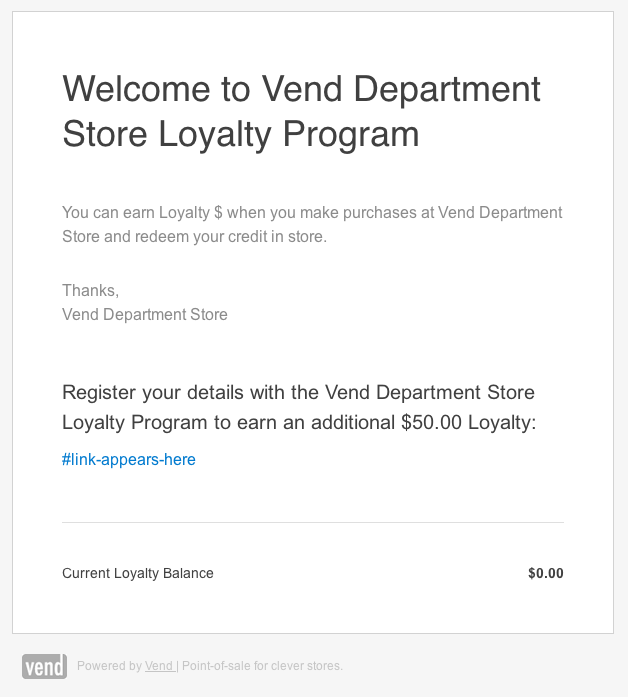 Setting Up and Using Loyalty in Vend – How can we help? Vend Loyalty is a system where your customers earn dollars to spend in your store with every purchase they make. It's designed to be as simple as possible for you and your customers. This means no points. No buy 9, get 10th free. Simple and easy for everyone to understand. The aim of a loyalty program is to increase customer retention, and also to provide you with valuable information about your customer base. What do I need to know before I set up loyalty? How do customers redeem their loyalty? What happens when I void a sale? What happens when I complete a return? These loyalty amounts will be earned on all sales to eligible customers made in the store. Your customers can then redeem their loyalty on any products in your store. Your existing customers will already be signed up, and it's easy to add new customers, or they can add themselves. Each time a customer makes a sale, their receipt will include their loyalty earned, and total balance available to spend. Customers will only earn the loyalty for a particular sale when the sale has been paid in full. If a customer pays for part of their purchase with loyalty, they will only earn loyalty on some of the sale. If 20% of the sale were paid with loyalty, customers would earn loyalty on the remaining 80% of the sale. Because 50% of the sale was paid with loyalty, 50% of the entire sale will not earn any loyalty. The customer would, therefore, earn 4.50 dollars of loyalty in the above example. All sales earn loyalty at the time the sale is closed (i.e., fully paid for). This includes On Account and Lay-away/Layby Sales. Customers using online store integrations, such as Dremus, RocketSpark, or Shopify, and who receive more than a small volume of sales through their online store, should not enable loyalty. Customers using the Timely integration cannot use loyalty. If you are using Xero, you will need to set it up to track your loyalty given and loyalty redeemed correctly. To learn more on this, click here. The only way to import balances from another loyalty system is to complete this manually. Choose the amount a customer needs to spend to earn 1 dollar (or £ or € or similar). The remaining settings refer to your customer sign up process. To encourage customers to fill in their details, you can choose to offer a 'joining bonus' for filling in the form. This can only be claimed once per customer. You can also choose to send your customers a welcome email. The welcome email invites the customer to join your loyalty program and provides them with a link to your online portal. If you have chosen to provide a loyalty joining bonus, these customers will also receive this. Select the welcome email box. Personalise the email content in the text edit box. You can preview your changes by clicking the 'preview email' link. Once you've turned your loyalty program on, you might want to customise the loyalty amounts earned on some products. You could set them to zero loyalty, or set them to a fixed amount. Products that have custom loyalty amounts do not have the loyalty amount adjusted when you change the price of the product sold (for example, discounts). Any other admin products, like cash float. To customise a product's loyalty amount, open the product edit page. In the loyalty section, select the custom loyalty option, and type the amount you'd like to set. Customers who do not wish to be enroled. Loyalty can be turned off one by one, or in bulk, using a CSV import. Open your customer page, and find the customer in your customer list. Click 'View' to open the customer's page. If you're not familiar with Vend's price book feature, check out the article here. It's easy to move your existing loyalty program to Vend. Our support team can import existing loyalty balances into Vend for you, so you can continue right where you left off. All you need to do is provide us with a list of your customers from Vend and their current loyalty balances. The only thing to consider is that Vend uses a currency based loyalty program, so if your existing program uses points or free items, you'll need to convert any existing balances into your currency and set the new earn rates accordingly. If you've got an accounting system integrated with Vend, it's important to understand how it will work with Loyalty. Once your loyalty program is set up, there are a few tricks to making it run smoothly. There are several ways to add a new customer to loyalty. Add the customer when they are in your store: Use the '+' button on the Sell Screen to add a new customer. Make sure the 'enable loyalty' box is ticked. Remember, the customer may get a welcome email, depending on your settings. If you are using the new Register you can add a new customer by clicking on create new customer in the checkout section. The customer can add themselves. All receipts for new customers will have a custom link at the bottom. The customer has seven days to follow the link to sign up. Sometimes, a customer may advise you that they do not wish to be part of your loyalty program. To disable loyalty for a customer, navigate to Customers -> Customers in Vend and find the customer. Click on the customer's name and select Edit Customer. Once here, untick "Enable Loyalty for this customer". After you've done this, the customer will no longer receive loyalty on sales. Sometimes, you might need to adjust a loyalty balance. For example, you might have given a customer the wrong amount of loyalty. You can create and use a loyalty adjustment product to manage this. Create a new product. Give it a name like "Loyalty Points" or "Custom Loyalty". It should have zero supply, retail and tax. However, when you get to the Loyalty section, give it a custom value of $1. Also, disable Stock Tracking (at the bottom of the page). Start a new sale. Add the customer to whom you're giving the store credit. Add the Loyalty Store Credit product. Alter the quantity to the amount of Loyalty who want the customer to receive. Eg: a quantity of 20.5 will give the customer $20.50 Loyalty. Hit pay and use cash as the payment type - as that's the simplest workflow for a $0 sale. If you check your customer, you'll find they now have the Loyalty points in their account. When a customer wants to pay for a sale with their loyalty balance, it's simple and easy for your staff. Just add the items to the sale, add the customer to the sale, and click 'Pay'. To pay the entire sale with loyalty, simply choose the loyalty payment type. This will be greyed out if the customer does not have enough loyalty to pay for the whole sale. To pay part of a sale with loyalty, type the amount to be paid by loyalty into the total field. This must be equal to, or less than, the total loyalty the customer has. If it is, the loyalty payment button will now be available. Click the loyalty payment button. Then, pay the remainder of the sale off using another payment type. When you void a sale in the history screen, any associated loyalty will be removed from the customer's account. When you return a product, the loyalty amount associated with that item will be removed from the customer's account.